Are you looking for an allergy-friendly frozen treat to beat the heat? 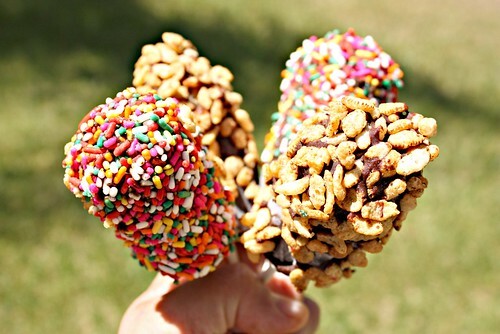 Try these chocolate banana pops. My kids LOVE them! I used Enjoy Life chocolate mega chunks and Spectrum organics shortening for the coating. For an added crunch, I rolled them in crispy brown rice cereal. You can even get the kids involved in making them. Another variation that I've tried is to spread a thin layer of sunflower seed butter (Sunbutter and Trader Joe's are brands that I like) all over the banana pops and then freezing them. Then I covered them with the chocolate coating and rolled them in crispy rice cereal. I also covered some in rainbow sprinkles. So pretty. Peel and cut each banana in half crosswise and insert a popsicle stick or lollipop stick into the cut side of each half. Place on a tray, cover with plastic wrap and place in the freezer for at least 2 hours or until frozen. Melt the chocolate and shortening in a double boiler, over low to medium heat and make sure the water is not touching the bottom of the bowl. Remove from heat. Place the puffed rice cereal in a shallow dish or a plate. 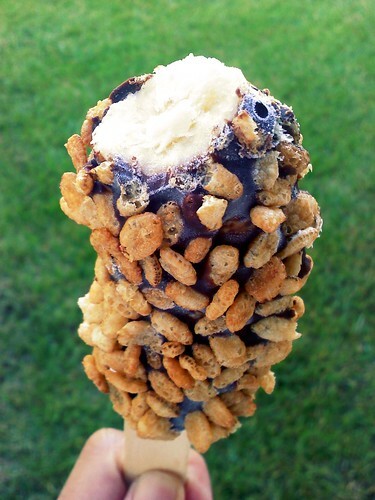 Dip the frozen banana into the chocolate coating, turning it to coat (you can use a spoon to help you coat more evenly) and immediately roll in the crispy brown rice cereal. Place on a tray covered in waxed paper. Serve immediately or wrap individually in plastic wrap or waxed paper and freeze for up to 2 weeks. these sound fantastic and i plan on making them for my son (allergic to peanuts and eggs). also, thank you so much for sharing your dessert recipes on your blog. it is such a great resource for parents dealing with allergenic kids.